Added a new setting: 'Axis - Move'. Note: The 'Arcs' haven't been adapted, so you will probably want to turn them off. 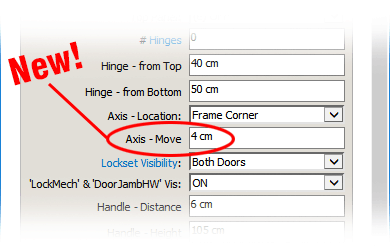 You will also want to set the number of 'Hinges' to 0 since they aren't relevant on a pivot door. Restart Sketchup after the update! If you mean to show the ‘swing arcs’ for a plan view, yes, there is a setting for that, though it will not currently work for pivot doors like those in the video above. If you’re referring to a window with an arch on top, it’s not currently possible, though we may introduce that in future flex components.